You deserve the right to decide how salty your food is. And the government agrees with you. The FDA released draft voluntary sodium targets for a variety of foods. Food companies and restaurants that adopt the voluntary targets will lower the amount of sodium in their foods to meet them; making healthier foods available to you and millions of other people. This means you will have the power to choose the healthier option. We need your voice to demand change! Tell food companies and restaurants to continue supporting sodium reduction, and encourage more food companies to break up with salt. Write to the CEOs of food companies and restaurants to make your voice heard. Thank you for taking action to take back control of sodium. Now, tell your friends! Encourage others to voice their opinions by sharing your actions on social media. 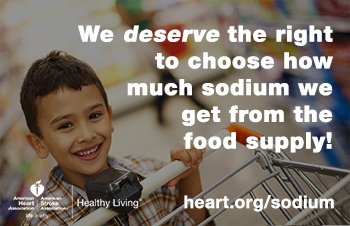 Read more about how we are helping to reduce sodium in the food supply.